Free WiFi. Download movies to our flat-screen HD TV monitor. Eclectic library of books, games, CDs, and DVDs. Hang-gliding, including lessons, from Cape Kiwanda (4 miles south). Horseback riding on beach or trails. Nearby stables rentable by day or week. Quiet & secluded. Floor-to-ceiling windows open into view of native hemlock & Sitka spruce forest. Tierra del Mar at sunset. Walk for miles and miles on this very quiet, little-known beach. This overlooks the woods with floor-to-ceiling picture windows. 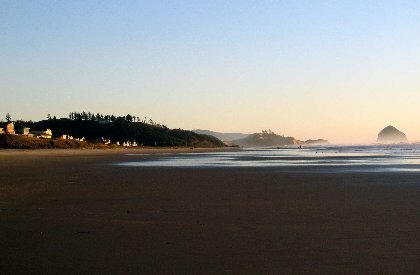 Beautiful, quiet beach stretches from Cape Kiwanda to Cape Lookout. Tierra del Mar can be seen in the distance. This is the little-visited north side of Cape Kiwanda,about a 3-mile walk down the beach from the house. Tiny (12' x 12') and very, very cute bunkhouse, sized just for kids. Located 3' from main house, adjoining kitchen patio. Dining area adjoining living room. August 9, 2015 (Pier Street house): What a perfect getaway! So quiet and close to the beach, we will definitely be visiting again. August 29, 2015 (Guardenia Street house): The master bedroom is heaven on earth and was truly a magical place to experience. We want to live there!!!!!! September 22, 2015 (Pier Street house): Great place. Close to a beautiful beach. Lots of things to do in the area. The house is comfortable and has anything you could need. We will definitely stay here again. September 20, 2015 (Guardenia Street house): We just spent a week at Susy Wolfson's cabin on Guardenia Street in Tierra del Mar. What a great place for a beach vacation. The master bedroom is amazing.......lots of big windows that look out into the woods and provide tons of light even on a gray day. There are books and games for those times you might like to just sit and relax. The beach is long and most of the time we had it all to ourselves. Our Golden Retriever, Annie, was in heaven chasing balls and running on that beach. The town of Pacific City offers lots of good places to eat if you don't want to spend your vacation cooking. We recommend the Pelican Brew Pub for the food and view. The Mexican restaurant in town had really good food as well. Oh, and don't miss out on the Grateful Bread Bakery. Really good pastry and breakfast. If you want to go sightseeing there are lots of places both north and south of Tierra del Mar that are fun to visit. We highly recommend the Tillamook Cheese Factory for great and inexpensive lunches and of course their ice cream! If you feel like a day trip, we recommend traveling south to Newport and visiting the Oregon Coast Aquarium. Awesome! I spent the first 50 years of my life living in Oregon and visiting the coast on a regular basis and have been away from Oregon for about 16 years so we can't visit as often as we would like. Lots of things have changed and most of the bigger beach towns have grown a lot and there are way more people than I remember. However, we found that Tierra del Mar/Pacific City still has that funky little beach town vibe. The cabin isn't fancy but it is cozy and comfortable and it's like visiting in someone's home. In our opinion that's exactly the kind of beach house that is perfect for a week at the beach. March 4, 2016 (Guardenia Street house): We enjoyed our stay at the Guardenia Street house. The house was very comfortable, afforded easy beach access to miles of quiet beach, and worked well for us and our 2 dogs. Having a full kitchen was very convenient and it was a nice surprise that the grill turned out to be a Weber kettle meant for charcoal (always provides better flavor than gas grilling). The house is set up for a relaxing stay and includes games and some DVDs if you're waiting out a storm. For music the WiFi enabled us to stream Pandora. Altogether, the house exceeded our expectations and provided a enjoyable getaway location. Thanks! Mark. July 25, 2015: We really had a great stay at the Guardenia Street house. The location to the beach was excellent. We brought with us our 13 year old son and his 13 year old friend. They spent most days boogie boarding with stuff we rented from Moment's Surf Company. My son wasn't too bothered by the 57 degree water but his friend needed the wet suit and together they had a blast. The house is very quiet. Even though it is right on the main street, you don't even notice it because you are tucked in nicely among the trees. The master bedroom is very spacious and comfortable. And while the number of windows (I think my son counted 40) made us nervous about what the sun coming up in the morning would be like, the trees block the majority of that so it was a very pleasant and comfortable experience. There is an extensive library of books, movies and games to keep everyone occupied. I enjoyed reading two books on the beach that week. No TV, but with the wifi and all of us bringing our technology with us, we didn't miss out on anything. We were even able to connect our iPad to the TV monitor via our own HDMI cable we brought and watch HBO and Netflix. It sort of forces you to actually be on vacation and not let the noise of the world invade your dreams. We went to the beach everyday. It was a short walk down Guardenia, and we would drive our truck to the end, drop off the beach stuff (chairs, boogie boards, towels etc...) and then one of us would drive the truck back to the house and walk to the beach. It was nicer than having to walk with arms full of stuff but it was a short enough walk that it wasn't a big deal to drop off the truck and walk back. The boys stayed in the bunkhouse. It was a bit stuffy when they first got into it, but once they opened the windows and aired it out it was a nice place for them to have to themselves and feel like they were in a college dorm on their own. No Wifi coverage out there for them so they really couldn't stay up all night watching videos on their iphones or laptops, but they were exhausted from their daily wave fighting so staying up wasn't an option anyway. We cooked all meals except 4 in the kitchen which was a great money saver for us. And we didn't have any problems with finding stuff to use except for a pitcher for lemonade. We did improvise with a tea pot but other than that, we had everything we needed. Having to bring our own beach and bath towels was a bit of an inconvenience only in that we had to pack enough for 4 people. But it wasn't that bad and with the washer and dryer on the premises it was easy to clean off the beach everyday. 9-11-15 (Pier Street house): Great house, very clean. Would recommend to anyone. See the Rock man across the street. He has wonderful things to see and buy and he is very nice! 9-26-15 (Pier Street house): Thanks Susy for yet another wonderful coast vacation! Three friends, three horses and two dogs took advantage of the Monsoon Special for a long weekend getaway... It just couldn't have been more perfect. Gorgeous weather sans monsoons...pristine beach...house with all the perfect touches to make it feel like home, only better. The horses settled in immediately at Crazy A's Horse Hotel just a few miles away. We walked and rode on the beach every day, splashed in the waves, cooked great meals, played games, slept blissfully. We stood outside and watched the sky and the ocean change color. We ate a huge breakfast at the Grateful Bread (of course!). Sam and Eddy the mini-dogs loved the backyard, the seagulls and the Beach Bunnies (AKA actual rabbits who hopped away just out of reach!). One afternoon we rode all the way south to the Cape and surprised a sea lion who then kept popping up to look at us from between waves. Can't wait to come back! 4-18-2016 (Guardenia Street house): Full disclosure- my wife and I love the Oregon Coast and are especially fond of Cannon Beach but let's face it, 3 nights in a hotel and 3+ days of meals at the restaurants is equivalent to a monthly mortgage payment. Plus factor in the crowds, potential noisy hotel neighbors and the fact many won't accept our 4 legged babies- Enter the Guardenia Street house! July 20, 2015 (Guardenia Street house): Super grateful for our time at Tierra del Mar. All ideas of what this 4 day getaway in Oregon were above and beyond what we had envisioned! Easily walking down the lane from your Guardenia house and over the little dune and glimpsing the beachfront was like stepping into a dream! You were a pleasure to do business with from start to finish, Susy. You left no detail unaccounted for. Full bang for the buck! From the perfectly stocked kitchen ( it has everything and then some! ) to the extra linens, blankets, to the garden herbs which made it into my cooking, to the nice array of books and games, the drying rack and even hose outside to wash off sandy feet and messy dog, we were WELL provided for at the Guardenia house! The 5 of us and our golden retriever were able to thoroughly relax and enjoy all aspects of the gorgeous beachfront and of your comfy, cozy home. The pride of ownership and your obvious love and respect of 'dogs and their humans' as you so aptly put it, has made this an inviting vacation to both plan for and enjoy while there. Truly, truly recommend this to others seeking an ideal Oregon beachtime with or without kids or dog. Hope we can be back next year! Thank you! Lindy, Marco, Clara, Anika, Luke and Shadow the happy golden retriever! 3/3/15 (Guardenia Street house): This house is PERFECT! It's nestled up into the woods but only a block away from the beach. You can still hear the ocean from your bedroom. All rooms had skylights which allowed for viewing the full moon rising and passing over the house as we snuggled in for the night. The fire place was my favorite part of the house. I can't provide enough praise for how comfortable and convenient this setting was. I will be back often! Thank you Susy! Sarah M.
2/8/15 (Guardenia Street house): A very comfortable house. Has the feel of a home rather than a rental. Nice spacious fully stocked kitchen made mealtime easy and low stress. Couches and chairs in living room are super comfy and invite one to snuggle down with a good book for the afternoon. Excellent Wi-Fi. Short walk to a beautiful beach. Short drive to trail leading to Cape Lookout (recommended!). Despite being close to the main thoroughfare the road noise is not noticeable at all. Beds were all comfy....and the windows/skylights in the master bedroom gives one the feeling of sleeping outside! Only drawback is a single bathroom/toilet means lots of coordination among guests. Excellent stay! Michael B. 10/29/13 (Pier Street house): We usually stay at the LaGuardia house, but that was booked so we stayed at the Pier Street House instead. Twas nice and quiet and well appointed. We were nice and cozy and had an amazing 4 out of 5 days of sun for lots of beach walks. Now we'll just have to decide which house to stay in on our next trip - they both have so much to offer! Karen T.
11/14/13 (Guardenia Street house): This was our fourth time at the cabin, and we have enjoyed it every time. Looking forward to coming back next year. Very kid and pet friendly. Mark P.
11/22/13 (Guardenia Street house): My husband and I had a great anniversary weekend at the Guardenia house in November. It is a lovely, private home tucked in the woods and only a short, easy walk to the beach. The master bedroom is huge and the kitchen is well stocked with dishes and necessities. We really enjoyed the fireplace which has a fan built into it that adds to the coziness (this was November after all). We didn't take any kids but the separate kids quarters with the bunkbeds looked really cute. We will definitely be back! Barbara W.
9/12/14 (Guardenia Street house): My family and I recently stayed at the Guardenia Street house and we had a blast! The location of the house in the trees was awesome and very quiet. The time we spent in the house was comfortable and we were able to keep entertained at night by building the fun puzzles that were at the house. (We found some of the mystery pieces Susy haha) You could hear the ocean when outside. The walk to the beach was not bad at all. Just right across the street. The beach was quiet and enjoyable. We were able to take a lot of walks and see some seals and seabirds. When the tide was high the waves were incredible and thundering. It was basically just us on the beach most of the time and very funny that there was chaos on the other side of Cape Kiwanda with all of the surfers and beach goers. 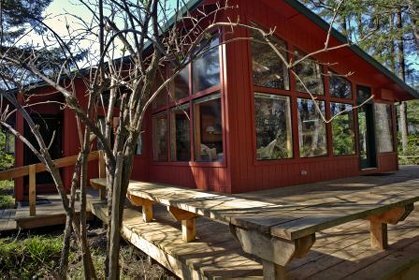 I highly recommend this property if you are looking for a quiet escape where you can enjoy the forest of Oregon as well as the beach without the craziness of the bigger beach towns. Lindsay N.
6/5/15 (Pier Street house): What a splendid weekend at the beach! It was the ideal escape from the city heat and we enjoyed hours of walks, loads of bird life and sunny yet pleasantly cool conditions. As always the Pier Ave. house was so comfortable - love the new TV and it's great to have WiFi. Everything was shipshape when we arrived. We did some birdwatching on the back deck, too. Wish we could have stayed longer, but we hope to return in September. Thank you! Ita L.
8/2/13 (Pier Street house): We just recently moved to Oregon from the East Coast and this was our first adventure for a weekend at the Oregon (West) Coast to celebrate our anniversary and husband's birthday! It was a great location - just a few blocks from a wonderful beach. The beach was clean, big, beautiful and almost our own (I think we only ran into 15 people the entire weekend and most were during a long beach walk to haystack rock (about 4 miles) near Pacific City and near a big sand dune. The house was clean, well appointed with games to keep our kids busy at night, movies for the blue-ray, etc. Our little Basenji dog loved it as well as she had her own little yard and doggie door and she finally decided she likes the beach too. I cannot say enough positive things, but to top it all off Susy is great to work with. She answered all our questions and guided you through the house and area with a suggestion of things to do, information about the workings of the house, and everything. We will definitely be back. Thank you Susy! (BTW I am sending a few pictures to you the kids made for you along with the other item.) Debra W.
3/7/14 (Pier Street house): Our stay at the Pier Street house was ideal. The house is very clean yet comfortable with updated appliances and a very cozy wood burning stove. The backyard is nicely fenced in for the pooches and has a lovely covered deck. The beach is half a block away - is very easy to get to with great views of Cape Lookout to the north and Cape Kiwanda and Haystack Rock to the south. Pacific City and great beer at The Pelican are only minutes away. I look forward to my next stay! Thank you, Susy, for providing a relaxing beach home for my families spring beach vacation! Sarah M.
4/3/14 (Pier Street house): Susy, thank you so much for having this wonderful property! We felt that we had a home away from home. It was very clean. All the dishes and the well-equipped kitchen was a joy to have. The quiet surroundings was so peaceful to the body and spirit. Anyone that we happened to run into was very welcoming and friendly. Despite the fact that I was not feeling very well, we had an awesome mini vacation. The dogs had such a wonderful time and enjoyed snoozing in their beds without the sounds of traffic and other noises from the city. We relaxed and enjoyed not having work demands and ringing phones. The beach was fantastic!! We haven't seen our dogs have so much fun in an long time. We would love to visit again and even try out the Gardenia House next time. Thank you so much for having this property available. We would recommend it to anyone we know. 4/4/14 (Guardenia Street house): It was a great escape for us and our two dogs. TONS of room, kitchen is stocked with pots, pans, dishes, etc that you may need. Just bring food, charcoal and you're set. BBQ or cook inside if you need. Fireplace was great too, being able to come in from the cold beach and warm in front of the fire. Very relaxing and quiet. I loved the view from the master bedroom, TONS of windows to see the woods and watch the rain fall. Thank you Susy for renting out this place, you can tell it has tons of love in it. Steve T.
4/10/14 (Guardenia Street house): We enjoyed our time at the Guardenia Street house! It was so nice to have a place where we could bring the dogs and our children. The set up of the house worked great for us - everything was in the kitchen that we needed and there were even puzzles and books for our little ones. The beach was just a short walk away and very beautiful. We are looking forward to our next trip back! Betsy B. 7/2/14 (Guardenia Street house): Great location (only one block to the beach) and lots of space for families looking to rent. Our family of four was more than comfortable, and we didn't even use the bunk house. The master bedroom is the best part; you feel like you are waking up in the forest. The kitchen was also very clean and well stocked. Lisa D.
7/17/14 (Guardenia Street house): We love this house! Its our second time in this house and it doesn't disappoint. Its great for dogs and nice to be able to bring along our furry friends. The TV upgrade was a nice touch. It was very comfortable and we very much enjoyed the deck and sitting around the living room when we weren't at the beach, which is just a short walk away. We will definitely return! Glen J. 10/5/14 (Guardenia Street house): My wife and I, along with a little Brittany dog, absolutely enjoyed our stay at the Guardenia Street house. It is capable of housing many more people, but was warm and cozy just for the three of us. The Owner has thought of everything, it seems, even small extras that really make for a pleasant stay. The house is right next to the main road, but it is lightly traveled and didn't bother us. We did have to cross it and walk a block to the beach, but again, this wasn't a negative. The house is well appointed and very clean. There are books and videos and many extras to make your spare time pass by nicely. The master bedroom is huge and is almost a house within itself. 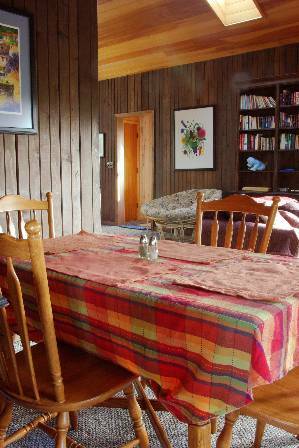 It is cozy and looks out the back towards the beautiful wooded forest. 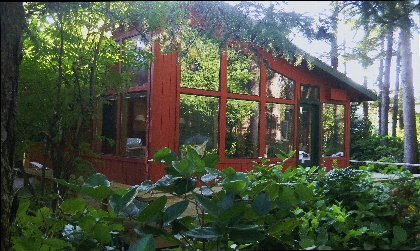 There is a large wood deck surrounding two sides of the house and it is a perfect place to sit and read, or meditate. The layout of the house is good and comfortable. We will stay there again, I'm sure. Roger H.
10/6/14 (Pier Street house): We had a wonderful time at your Pier Street beach house! It is cozy and comfortable (NOT to be interpreted as "shabby") and has everything a person could need. The beach is fabulous and not crowded and we loved watching the bunnies-as did our dogs!! You have a great thing going there and we will definitely be back. Mary M.
10/16/14 (Pier Street house): The Pier Street House was just the getaway that we needed. It was very clean, well-stocked, and cozy. The dog-friendly nature of the house was a huge plus. Susy replied promptly with any questions or concerns that we had setting up the rental and provided us with ample information regarding the house, surroundings, and directions to the house and local attractions. We will be back soon! Daniel N.
10/23/14 (Pier Street house): Very big house for the 3 of us, plus our dog, everything worked; really was a nice haven from the storms. Internet WiFi worked, but seemed to be a little slow if you wanted to stream a Netflix; but your at the beach to get away from that sort of thing. Otherwise good for checking email, since cell phone service isn't good for Verizon there, but you can go down to the beach and get a cell phone signal there. Eugene F.
9/8/13 (Pier Street house): I enjoyed the cottage and it was perfect for me and my dogs. Loved the mudroom and doggie door! The bed was very comfy and I slept great. I could hear the ocean with the windows open or when sitting outside on one of the decks. There are lots of books and games too! It's just a short stroll down to the beach. What a great beach! Didn't see very many people and there was plenty of sand to walk on even during high tide. Pacific City is just a short drive for fun and food and people watching. We drove up to Munson Falls and that was lovely as well. There is a state park nearby - Cape Lookout. Interesting drive past the sand dunes in the forest and up the hill to the rainforest and then down to the park. Nice picnic tables right on the ocean (day use fee of only $5). The weather was great and we had a really nice time. Nancy C.
6/22/14 (Pier Street house): Thank you for our lovely vacation, we really enjoyed our stay in your house. We will miss sitting at the dining table watching deer walk down the street in the evening and bunnies eating breakfast. The short walk to the beach was really convenient, especially with an infant. The securely fenced backyard worked really well for our dogs. There aren't a lot of places that cater to the needs of a family with an infant and two dogs, but your house worked great for us. Cassandra S.
7/4/14 (Pier Street house): Another great stay in Tierra Del Mar! As always, the house was comfortable, clean, and well stocked with household items to make our stay easy. It is apparent that the home is well maintained and cared for, which does make the house feel welcoming and comfortable. We appreciate knowing that we can show up and relax because there's not much to worry about. Reservations are easy, and communication was great (as always). We love being close to Pacific City, but also having a much less crowded beach steps away for just relaxing. It is a wonderful home to stay in at the beach, and definitely recommend staying here! Thanks again for another great vacation!!! The neighborhood is so quiet- we see more bunnies than people much to the delight of our dog! Margie A. 3/20/15 (Guardenia Street house): We spent three days during spring break 2015 at the Guardenia St. House and enjoyed every minute of it. Although the weather was changeable we took several, well timed, walks on the beach. The evenings were cool so the fireplace was quite welcome and we spent a lot of time lounging on the couches in front of the fire. Everything we needed in the kitchen was provided. It was great to just relax while the wind blew in the trees. Sierra R.
own. They wanted the same one. We were laughing out loud watching these two dogs carrying the same stick with their muzzles side by side as they swam and scrambled in the surf. So much fun. If you get a chance to go here, take it! Jane D.
7/18/13 (Pier Street house): Wonderful place very close to the beach. Was very roomy and comfortable for our two families. the kids had a blast playing at the beach and we all enjoyed just hanging out in the very comfy living room and the different decks. the place was great for our dogs as well. it was so nice to have a yard to let them run in, and great access through the doggie door which they figured out in no time. would definitely stay here again. in fact we are looking forward to our next visit! 7/26/13 (Guardenia Street house): Our family of 6 had a wonderful vacation at the Guardenia Street House. It is spacious, clean, private, and well maintained.The kitchen was well stocked with dishes and appliances. The owner was very helpful, always available and responsive. There two bedrooms one very large and comfy and in the second one the bed was small for two people to sleep! We would definitely rent this property again - we enjoyed the trails and the beautiful Oregon Coast, which was very convenient. 9/10/14 (Pier Street house): September is the most wonderful time to visit Tierra del Mar! We had miles of open beach, blue skies and terrific weather. The Pier Street house was better than ever - new futon, new reclining sofa (so comfy) and a fully equipped kitchen. It was home-away-from-home. We are always grateful to be able to bring our dogs along, a golden retriever and Labrador retriever. It was especially poignant this year: our black Lab has lymphoma and this was likely his last beach trip. He bounced around like a puppy and enjoyed his (short) walks to the beach so much. We will be back, of course! This is a great base for activities in and around Pacific City, too. Ita L.
9/16/14 (Guardenia Street house): We wanted to find a relaxing place to enjoy our Anniversary, one that would take our fur-kids and we found it, thanks Suzy. Most places won't take dogs the size of our babies or their breed, so I want you (Suzy) to know how very much we appreciate you accepting our "kids" into your home. We all had a great time. Found it very cozy, quiet and tranquil, would definitely recommend your rental to anybody, as a matter of fact, we already have. Love how the house backs to the forest and that you can hear the waves crashing, so peaceful. Hope to make it to the coast again before too long and when we do we will contact you for reservations. Thank you!!!! Brook N.
6/13/15 (Guardenia Street house): We had a wonderful visit at this house and the beach. As soon as I saw the great big bedroom with the view into the forest, I knew I wanted to rent it, and it was exactly like in the photo. The house was comfortable, such a short walk to the beach, and a great place to relax. There were one or two small problems with the housekeeping but I'm sure they were one-time because there was a new housekeeper, and the owner was so responsive that I'd stay there again in a heartbeat. My only disappointment was I didn't see a bear. Darn! But we took lots of walks, went to Cape Lookout, and had a fun meal at the Pelican Brewery. Too bad we didn't have little kids or teens with us because the bunkhouse looked adorable. Susan R.
5/9/15 (Pier Street house): My mother and I went here for Mother's Day. It's a cozy house, we had everything we needed. Susy's directions were clear and everything as described. Really nice little place for a getaway with the beach just down the street. 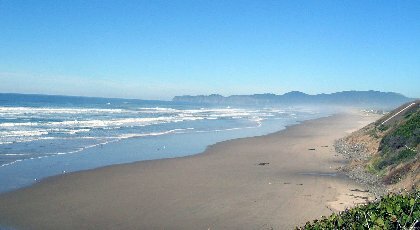 Pacific City is 10 minutes away and there are plenty of places nearby for hiking and beach activities. Carly S.
3/21/15 (Pier Street house): Wonderful property. Great location and a very short walk to the beach. The yard worked out great for our dog. The owner's communication was very helpful. Greg R.
3/29/15 (Pier Street house): The house is on a quiet, private street, and is extremely near a very nice and expansive beach. With the windows open, you can hear the waves crash. The house is very comfortable, and worked very well for the five adults, two toddlers and a greyhound dog, who was extremely tempted by the rabbits that roam the neighborhood. The house isn't terribly luxurious, but it has more than you need to make a very nice time away from where ever. Brett R.
4/3/15 (Pier Street house): If you decide to rent this house you will be in for a real treat! The house gives you many comforts of home with lots of peace and quiet if you so choose. The beach is unspeakably beautiful and nearly empty of the public. It is so long that we never made it to either end. We will return one day. Worth every dollar spent! Molly G.
3/13/14 (Pier Street house): We loved staying at Susy's beach house. It's perfect for our family. I like how the kids room is next to the master bedroom. The layout of the home is great and very open. We had everything we needed. We will be back. Thank you! Mia C.
3/27/14 (Pier Street house): We had a wonderful time at the Pier Street house. Tierra Del Mar is such a beautiful beach and so quiet. We practically had it all to ourselves. Cape Kiwanda is a very short drive to the south, we hiked up the big hill, took in the view, explored the tide pools and our son and his friend walked back to the house via the beach. So beautiful. Also loved spending time in the trails just north of the house. So many shades of green this time of year. The house is so cozy and fully equipped with everything we needed. Thank you Susy! We will be back I'm sure. Christine F.
6/28/15 (Guardenia Street house): Lovely getaway in quiet Tierra del Mar; we enjoyed exploring the coast from this house! Kids loved sleeping in the bunk house, lots of games and books to keep us busy when we weren't on the beach. Second bed was not great for 2 adults, but the bed in the master bedroom was huge! Ideal for one family, doable for 2. Sara Y. 7/8/15 (Guardenia Street house): This house has the MOST AMAZING master bedroom, 18 windows looking out into the trees. This is how you should wake up when you are on vacation. The surf was perfect for boogie boarding while we were there. Great house, lots of seats for everyone to rest after a day spent in the ocean and on the beach. We loved it! Tammy S.
9/5/13 (Pier Street house): September in Tierra del Mar is the best time of year - perfect weather, miles of beach and the lovely Pier Ave. house to relax in! We've stayed here before, but with all the recent upgrades it's better than ever. We spent time in Pacific City, then up the road to the Tillamook Cheese Factory and the Blue Heron Cheese Factory. Long walks on the beach were much appreciated by dogs and humans alike. It is very nice to have WiFi at the house - thanks so much for this bonus! We will certainly be back soon. Maybe a little storm watching is in order this winter. Ita L.
9/11/13 (Pier Street house): All went well at the house for my family. It is well stocked and convenient to the beach. 7/4/13 (Guardenia Street house): We spent 3 nights at the Guardenia House over the 4th of July. The house is located on a main street that lead into Pacific City but is nestled in a woodsy and forest like setting which allows one to forget about the other side and to fully immerse themselves in the quiet and natural scene. Beach access was super easy. Walk out the door, cross the main street and just a few steps before you are in the small quiet beach of Tierra del Mar. We were thankful to have a quiet beach without having to deal with the crowds at Cape Kiwanda. Thank you Susy for a wonderful experience. Sul B. 7/9/13 (Pier Street house): This house was perfect - just the getaway we were looking for. We would love to come back again and stay longer next time. Probably won't be for a couple years as Pat's being posted to Ottawa for 2 years so we won't be back on the West coast for awhile. We will return once we're posted back to Victoria, BC again! 9/21/13 (Guardenia Street house): Overall a great place to stay and I would very likely stay again. There are lots of notes and helpful hints throughout the house. Tons of games and books which were very helpful since it rained much of the time. Wifi was a nice bonus for me. Either someone dropped off trash or the previous tenant left a bag of trash out next to the bin, which was gotten into by the local animals. The owner promptly sent someone out to clean it up :) This is the reason for the 'C' under cleanliness. The house was otherwise clean. A couple of minor things especially for first time vacation renter like myself... Include the shed access code to washer/dryer to avoid a call. The communication does say bring towels. You might include hand towels, kitchen towels, wash cloths as I only thought to bring bath towels. And maybe also mention to bring toilet tissue to avoid a last minute trip to the store. OWNER RESPONSE: Thanks for the very nice review! I do really appreciate you taking in stride your first glimpse of the house with trash scattered about! Garbage left in a plastic bag and the local raccoons apparently led to predictable results! Cheers to our great housekeeper who dropped everything to drive over and clean it all up! Just for reference, the access code for the shed and washer/dryer is provided in the info sheet I send to the renters as well as on the info sheet posted by the kitchen door. We did also have extra toilet paper in the supply cabinet; so sorry for the extra trip to the store, I'm guessing in the rain - ick! 10/17/13 (Pier Street house): Susy, we love this place. Now that we've been here twice, it feels like "our" place too. Humans and canines love it alike, and the beach is so fabulous, almost like our own private beach. Thank you for sharing! Selene J. 10/21/13 (Pier Street house): We had a wonderful time and the facilities were very comfortable and accommodating. The beach as amazing&#8230;so clean and an easy walk to the end of the street. The rock shop across the street was very interesting. A short drive to the Pelican for dinner on the beach was great! Kathie R.
10/24/13 (Pier Street house): This was a great home to rent for our family. It had such a safe access to the beach and the grandchildren could run to the sand and we had no worries, except for those "wild rabbits". What fun. 4/5/15 (Guardenia Street): What a fantastic place! It was so quiet and cozy. We loved the fireplace, the easy walk to the beach, the rain on the roof. It was perfect! Thanks for making it such an easy place to feel at home while away from home. Katie H.
4/18/15 (Pier Street house): Great place - will definitely come back. Loved how close it was to the beach without being too close! Had everything we needed and was nice and quiet. Donna B. 4/23/15 (Guardenia Street house): Wonderful!! Our stay here was very relaxing and enjoyable. The house was clean, cozy and backed up to a beautiful forest space. The master bedroom was our favorite part! It was like being in a cabin all to ourselves. The location to the beach was an easy walk and wonderful for our Fur person(Dog)! Pacific city and Cloverdale are very small but the people are friendly. The rental process was very organized and the owner was very kind and made sure it was a great visit for us. If you are looking for a wonderful, easy time away from the hustle and bustle of everyday life, this is a great place to rent! Carrie O. 5/1/14 (Guardenia Street house): We booked the house as a birthday surprise for my mother-in-law and it was a huge success. Our group contained people ranging in age from 5-70 and everyone thought the house was great. Our dogs appreciated the easy access to the beach ensuring frequent frolics in the surf. The neighborhood is super quiet as there are only residences and no businesses, but it's only 20 or 30 minutes drive south of Tillamook, and Pacific City is just a couple of miles down the road or the beach (five minute drive on the road or 30 or 40 minutes walking on the beach). The rental process was great and we were already talking about when we'd like to return before we even started packing to head home. 5/8/14 (Guardenia Street house): Very nice getaway. House very lovely and clean. Love the rain forest view from the bedroom, very peaceful. Everything available for a group large or small :) Elise W.
7/17/15 (Guardenia Street house): The Guardenia house was a lovely place to stay in Tierra del Mar, Oregon. It is nestled in the trees which kept it cool while the temperature on the beach rose to an unbelievable 80 degrees. A quick walk to the beach access, made it extremely easy to watch the gorgeous sunsets. The kitchen is roomy and bright while well stocked with utensils, cookware, and appliances. IF there is something you need for your cooking, check with Susy before bringing it! The beds were comfortable, even the bunkhouse beds! We were there to participate in the Labyrinth Network Northwest Labyrinth Festival (labyrinths were drawn on the beach). Jamie R.
3/21/14 (Pier Street house): Comfortable, family-frirendly and dog-friendly home. Love the whimsical decor and well-equipped kitchen (Bosch dishwasher and Jenn-Air range made preparing and cleaning up meals easy). The securely fenced back yard was a great place to let our Labs out safely, and being just a block from the beach was great for all of us. Pier Street appears to be one of the nicer streets in Tierra del Mar, with some newly renovated places. Pacific City is just a few minutes away if you need anything, and there's lots to do locally. Genevieve L.
3/25/14 (Guardenia Street house): We enjoyed good beach options at/near Tierra Del Mar, especially the Kiwanda dunes! The house is idyllic, just as described, with plenty of extras from kitchen gear to games and such. Fireplace worked well also. Brian S.
8/4/13 (Pier Street house): We had a great week on the coast. The house was clean and very well stocked. My grandmother ran a rooming house on Martha's Vineyard and she had two apartments with complete kitchens. I know how difficult it is to make sure renters have everything they could need. I enjoyed my stay and plan on coming back next year. Carrie N.
6/25/15 (Guardenia Street house): This is an A+ property, including the experience of communicating with Susy, the owner. Location is superb, just across the road from an excellent beach and a very short drive into Pacific City for meals or supplies. We visited several beaches along the coast, but ended up liking the one across the street from the house best. In summary, I've stayed in lots of beach houses in my day, but this is hands down the nicest, most well appointed, most beautiful of them all. And the way Susy handles her business is top notch. You can't go wrong by choosing to rent this wonderful house. My wish is that every guest who is lucky enough to stay here takes the same great care of this house as Susy does. We loved our stay and so will you. Melissa S.
5/18/15 (Guardenia Street house): This was the second stay at the Guardenia House for us. We enjoyed it so much the first time, we returned six months later. Our second stay was even better than the first. Good weather helped, but the house is what makes for a great vacation. It is the most relaxing pleasant place we have stayed on any coast. The owner has thought of everything, making the three days we were there pleasant and carefree. There are books, DVD's, games, WiFi, free telephone service, a complete kitchen, and much more. The place is very clean, well appointed, and comfortable. The back deck is great, a peaceful and beautiful structure. A short distance away is an outside table and bench. You can go there for lunch and listen to the birds. I'd like to keep this house secret, in a way, but must report that it's a terrific vacation home. Roger H.
Visitors might want to check out the rock shop nearby - some amazing minerals and gems. Their collection of Oregon Sunstones was impressive, and they have some pretty (and affordable) jewelry. Sally Tebbett, Feb 2013. We spent Thanksgiving there (two families) and the teen girls loved having their "own place" with the bunkhouse. I usually like to find new places for adventures, but we liked this home so much that we'll surely be back in spring or summer, so we can enjoy nearby kayaking and hiking. Thanks, to, to Suzy for making it all EASY! Anna - Nov 2011. We have stayed in this house several times and we love it! The yard and laundry room are perfect for our dog. The beds are extremely comfortable. Susy is great to work with. The kitchen has everything we need to cook with. Such a wonderful home away from home. Karen Stewart - Jul 2009. What a great little house. Just the right amount of room for everyone to be together and so close to beach access! We did not have a chance to use the BBQ or fireplace this time around but we will definitely be back. Loved all the windows on the back master bedroom and the view of the forest was so relaxing. Meghann Austin, May 2013. We just stayed at Pier St. House for 5 days (Dec. 2011) and as always, it was a wonderful, relaxing experience. We try to return every year. Had great weather- sunny and no wind, and had some good clam digging at nearby Whalen Island. Our young lab loves the doggie door and running for miles on the empty beach (we saw almost no one). The sun poured through all the S. windows making the living area very cheery, even in winter. The house was spotless and the kitchen is well equipped (unlike many rentals). The neigborhood is so quiet and the beach so close it is impossible not to relax! Margie Arighi - Dec 2011. The decorations are all very tasteful and made us feel like we were in the most well furnished home on the coast. We truely appreciate the level of effort put into this home and would recommend it to anyone. Michael Bowen, January 2013. What a lovely, quiet neighborhood and wonderful house! Super cozy, fun to cook in and there were bunnies!! The beach was so close and the sound of it from our room was very soothing. The kids loved the bunk beds and we loved the long walks on a perfect, uncrowded beach. Thanks so much for the wonderful stay, we will be sure to come again. :) "Thanks again! We had a splendid holiday and Easter was really special with the bunnies hopping around. My girls named them Hopper, Jessie & Sandy. :) What fun! And the weather was glorious, absolutely magnificent." Jennifer & Kevin Scott, March 2013. Access to the beach was close although did have to cross highway 101 to get there. Lynn Hughes, March 2013. Glad to hear you had a good time! Just to clarify though, Highway 101 is a good 10 miles from the house. The quiet rural road that you crossed to get to the beach is called "Sandlake Road," actually part of the "3 Capes Road Scenic Drive." The house faces backwards - away from the road - and opens onto the woods (shown in the main photo of the house). The back of the house does face the road, although it is set quite far back. Between the road and the "yard" are dense stands of shore pines, huckleberry, and other Oregon natives that essentially act as a 10- to 20-foot-high "shield." Through the kitchen window, you can see a sliver of the road if you look at just the right angle. This is the only place in the house (or anywhere on the property for that matter) that the road can be seen at all. Hope to see you in the future. Cheers - Susy. A very nice home -- very comfortable! The kitchen has everything you might need to cook. The warm fireplace was delightful! Sheila Bonczek, Oct 2012. The Pier Street beach house is perfect for a family vacation. It is just a short distance to the beach which was wonderful. The fenced back yard was great for our dog. We really enjoyed our stay and are looking forward to the next time! Sandy Panek - Oct 2012. We had a wonderful time. So grateful for the fenced yard and the utility room really helped with dog (and people) cleanup prior to going into the living part of the house. The house was very comfortable and the kitchen fully stocked. A block to the beach, and my dogs and I were in heaven. We will definitely come again. Janice LaJoie - Oct 2012. We very much enoyed our stay. Great place for family gathering. Sally Rahman - Sep 2012. September is just the greatest time to visit Guardenia Street! The weather was perfect and the accommodations were great, as usual. We had long walks on the beach with our dogs, some great meals, quiet time and play time. It's always a comfortable place to relax and recharge. The addition of WiFi access was greatly appreciated!!! We've been coming to Guardenia Street for years and will continue to do so (Pier Street is a good bet, too.) Now, we're looking forward to a little storm-watching this winter. Thanks so much! Ita Lindquist - Sep 2012. My husband and I were looking for a quiet place to stay and to bring our dogs to the beach. The Pier Street house was ideal. Susy was responsive and clear in her communication and clearly supportive of dogs. The house is modest on the outside but the accomodations were clean and comfortable. We really felt at home. The kitchen was well-appointed and we especially loved the mud room where the dogs could dry off and where we could wash our clothes on the last day. We also loved listening to the ocean from the master bedroom and how quiet the neighborhood was. We will definitely be back and would gladly recommend the Pier House for dog-lovers and families alike. Lisa LaForge - Aug 2012. Ashton & Travis, March 2013. Once again, we had a lovely stay at the Pier Avenue house with our dogs. Susy continues to make improvements to the property (this time some updated lighting) and as always, provides patient and clear communication. This visit was in the off season and on our Sunday walk we saw not a soul for miles except an eagle and her young on the beach. If you are looking for a quiet place to stay, I highly recommend Susy's little slice of heaven. Lisa LaForge, March 2013.
great house, quiet neighborhood and very close to the beach, we had an excellent relaxing weekend, thanks! Joe Stevens, Feb 2013. My husband and I wanted a quiet setting for our fifth wedding anniversary, and this home was the ideal location! Our grand anniversary plans were to go overseas, but with two bum guts and a very restrictive medical diet for both of us, we decided to stay close to home and go somewhere with a kitchen so I could prepare all of our meals. The pros were endless! - Super dog-friendly! They don't even charge a pet fee which is really kind! They only ask that you keep your pup off the furniture and dry muddy paws - the same rules that we have at home so that was easy enough. - The master bedroom alone was worth the stay! The pictures don't really do it justice. The king bed is surrounded by three walls of windows that look across a beautiful deck and into trees. - The beach is just a short stroll down the road; still close enough that you can hear the ocean at the house. - The kitchen was well stocked with gadgets, utensils, and dishes. There is even a little herb garden that sits in the window. - The home is stocked with books, games, maps, recipes - all really nice touches to help with your stay. - Though the front of the house faces the road, it is a quiet setting - especially at night. So relaxing! - I believe Pacific City was only 3 miles away. My husband hiked down the beach with our dog one day and I met him at a coffee shop across from Pelican. - There is also an estuary down the road in the other direction with a great - but short - hiking trail that takes you through the trees and then drops you out onto the sand. - This house would also be great for two families with children, since there is a ridiculously cute bunk house off the patio where the children could play and sleep. - My favorite thing about the house was a note in the kitchen: it listed the house instructions for when you leave, basically asking you to wash the dishes and take out the trash. Then it said that you didn't need to do anything else because you are on vacation. I loved that. It was a sweet gesture from the owner, who was just as kind every time I contacted her with questions about the house before we arrived. Advice (not cons really): - Bring your own soap for the shower - there was none - The pans were a bit beat up with non-stick coating, which I was hesitant to use. I see this at other rental houses too, so I think I will just start bringing my own pans. - Absolutely no cell service so be forewarned. Other than that, loved it!! So relaxing with no TV or cell phone service. I do have to say that it was nice to have internet connection though. I appreciate that everything in the house works - and everything you could need is there. All we had to bring was the food, which we brought too much of as always. We loved the short walk to the quiet beach just a half block from the house. Very comfortable accommodations and clean. We loved it and will definitely come back! Debbie McNew, Dec 2012. The place was great. We really enjoyed it, was our first trip with our new baby, and so nice to be able to bring our dogs along too. Ben Steinberg, April 2013. We had a fantastic stay at the Pier Streer House. 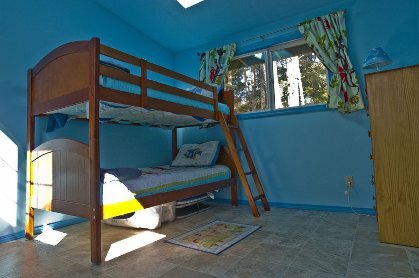 My three children enjoyed the bunkbeds upstairs and playing games around the large dining table. When it was raining the games and books came in handy and enhanced family bonding time. When it was sunny we walked the dogs on the beach or visited Whalen Island where we took a beautiful nature walk. Most of the time we felt like we had the beach to ourselves and even on Whalen Island we didn't see anyone else the whole time we were there. Next time we hope to get the chance to go kayaking or horse back riding on the beach! Holly O'Brian, May 2013. Have rented from Susy several times now and always enjoy her houses. She maintains them well and is very accommodating. David Beegle, March 2013. We love coming to this house! It's in such a great location and I love cooking in the kitchen. The dogs have a blast too. Becky Engelquist, Feb 2013. Stayed three nights, the home was nice and close to the beach. Just a couple things need mentioning I think the things to do and restaraunt guide is a little outdated. The second issue was the rat problem, was told there was a little mouse problem - well it's rats and hopefully that has been resolved because we had three restless nights. The days were great though! My family and I, including our two dogs, stay ed the Guardenia Street house over the weekend of 7/20/12. The house was amazing. the master bedroom and wraparound back deck were nicely done, and very accmodating to all 9 of us. The weather cooperated and we had planty of time to enjoy the tastefully done outdoor spaces. the yard is very green, with lots of screening trees and plants, so that you dont hear any traffice from the nearby road. you will have to cross Sandlake to get to the beach, but its not far at all and very private stretch of sand with excellent views of haystack rock. pacific City is a short 210 minute drive, with all that has to offer. we had a great time and the house slept all of us comfortably, with the kids really enjoying the detached childrens' bunkhouse. My husband, our black lab. and I stayed in the house for two nights to celebrate our 30th wedding anniversary. The sounds of the waves...the treehouse-like master bedroom...and watching the stars in the skylight over the bed...all wonderful. My two daughters, my three german shepherds and I stayed at Susy's Guardenia house the second week of May. We had almost perfect weather for a week on the coast, which is a miracle! We loved the nearby beach for running, playing and photographing. I got some stunning pictures of the early morning surf striking the beach! The house was perfect! Very clean, very comfortable...so much better than a motel. I have been wanting to come to Oregon and stay near the beach for 3 years, but having 3 spoiled german shepherds who will not eat unless I feed them presented a problem. Susy graciously allowed me to bring my dogs, who stay by my side whether I am indoors or outdoors. The accomodations were more than perfect, and a smile never left my face while I was there. I recommend this place to any who desire privacy, convenience, comfort...all at a reasonable price. Thank you, Susy. My daughter, grandson and two of his friends, from Sheridan, OR, spent 4 nights and 5 days, March 28 to April 1. Weather was lousy, but the boys enjoyed running to the beach anyway. The house is very cosy, especially with a fire in fireplace. So I was content to just sit there and read my book, and spending quality time with my daughter. An enjoyable time by all. feeling that sometimes is found in coastal rentals. Thanks Susie for keeping up a great house! Upon entering the Pier St. House, we were immediately struck by how comfortable it looked. The open space design, loft-like bedrooms, over-stuffed furniture, lots of windows and well equipped kitchen declared: "Welcome home". The mud room and fenced back yard were put to good use by our wet dogs. The close proximity to the abundant recreational activities was icing on the cake. The Three Capes Loop is one of Oregon's best places to explore. And what's not to like about being less than a block from an uncluttered beach? Thank you, Susy, for providing such an impeccably well maintained house. You obviously understand how to make strangers feel appreciated. Well worth the drive from Seattle. Nothing better than the pure joy of dogs romping on the beach. Unless it is the great beer at Pelican. No, beach wins. 1/9/12: We rented both of these wonderful houses for a small family reunion over the winter holidays. Having both houses was wonderful. An easy short walk between the two.Guardenia was perfect for relaxing and reading around the big firplace. Pier was perfect for large group meals in the large spacious open kitchen. Both houses were warm and welcoming. Really felt like being at home. The large master in Guardenia is fantastic. Three sides of windows and sky lights It was a great place to be on a stormy windy night! Can't wait to return in the spring - can't imagine ever staying anywhere else on the coast again! Thanks you Susy for creating this little oasis. January 9, 2012 Reviewer: Anonymous From: Corvallis, Or. We rented both of these wonderful houses for a small family reunion over the winter holidays. Having both houses was wonderful. An easy short walk between the two.Guardenia was perfect for relaxing and reading around the big firplace. Pier was perfect for large group meals in the large spacious open kitchen. Both houses were warm and welcoming. Really felt like being at home. The large master in Guardenia is fantastic. Three sides of windows and sky lights It was a great place to be on a stormy windy night! Can't wait to return in the spring - can't imagine ever staying anywhere else on the coast again! Thanks you Susy for creating this little oasis. is very close, which made popping in and out easy. door. Was perfect with our 3 year old Weimaraner. We just spent 12 days at the house, our second stay in 18 months. We encourage you to stay here if you are travelling with people you truly love and enjoy being around. 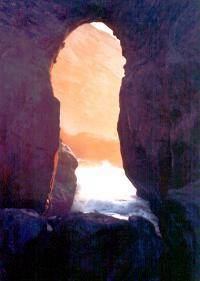 It's a nice quiet, secluded place to enjoy each other and relax on the beach or hike and explore the three capes. For those needing more "action" (i.e. teenagers) you can drive a few miles south to Pacific City where there’s lots of activities. It’s also an excellent place for foodies as there are lots of slow food producers in the area. We hope to make this escape an annual one for us. If you want to escape from your crazy City life, then this is THE only place to stay on the Oregon Coast. It’s well worth the 5-hour drive from Seattle. Curious about the neighbor's concrete structure, and they not being home, I walked over to investigate. Rounding one of the shrubs in the drive, I came smack dab up against a deer who was grazing the grass pad on top of the structure. Not wishing to offend, but thoroughly taken by our proximity, I spoke to her while she fixed me with a rude stare. Not wishing to be inhospitable, I offered her the only thing I had, a dog treat. I spoke politely, offering her the treat, almost putting my hand to her mouth. Her notstrils flared. She scratched her flank. Taking one backward step, she took my measure. Continuing to speak, hoping to pass muster, I wondered how to both prolong this and fetch my husband. Finally, impatient with my continual nattering, she moved to the other end, took up her grazing, and dismissed me. I went to get my husband, but by the time I returned, she was gone. Did he doubt my veracity? We spent the next two mornings lying abed, hoping to be spectators at another spectacle of deer. Our trip out to the coast was a mix of bitter and sweet. We learned a few weeks ago that our 5 year old Rotti has bone cancer, with only a short time left before we will lose him forever. I found this wonderful house in a pet magazine a few months ago. I contacted Susy to make arrangements to spend one last family vacation together. I can't even find enough words to say how warm and wonderful she is! I just knew that the house would have that same feeling! We arrived at night during a terrible storm and quickly got us all in and unpacked. The heat came on quickly and we soon snuggled up on the couches and cooked up dinner. Unfortunately, my "city boy" husband (and myself) couldn't get a good fire going, but the fireplace and living room are perfect to curl up to and read a good book. It rained terribly all weekend, which was just fine with us. We spent the whole time talking and snuggling with our baby boy. It was perfect! When we first got there and saw there was no cable (already knowing there was no wifi or cell service) we were a little disappointed, but quickly realized it was PERFECT and just what we needed! We are big movie watchers and discovered a bunch of good films in the cabinet. I happen to be a little older than my husband (by 10 years :) and we recently got married. Our entrance song to our reception was "Mrs. Robinson" from the graduate (although neither one of us had ever seen it), to our surprise it was there. We watched it and had a blast laughing. It was great! I wish I could say more about the area for new comers, but to be honest we didn't leave the house very much. A quick run to get lattes in the morning (Stimulus Cafe is great and the owner is so friendly!) and to the market a couple times, but that was all. The weather was pretty bad - but that just says how comfy the house was, since we had a great time! Susy and the house are just wonderful! Loved our weekend! It's hard to think of saying goodbye to our Rotti, but we have so many wonderful memories, especially last weekend! We THANK Susy for everything! We highly recommend her house to anyone with doggies! We absolutely loved our stay at the Guardenia House in Tierra Del Mar. It was like having a little piece of heaven for the week. We especially loved having such a quiet piece of the ocean away from all the more commercialized beach areas but yet close enough to these places to explore as well. This was the perfect place to vacation with our dogs - very quiet, private and a beautiful location as well as miles of ocean shore to walk and explore. Cape Kiwanda is magnificent and Tiera del Mar is a perfect location for photography lovers; every day brings new photo opportunities along the ocean with the changes in the environment. The Guardenia House was great; the master bedroom was especially awesome as it overlooks a beautiful huge deck and pathway into the forest where you can sit on a lovely bench and be able to listen to all the lovely birds singing. The Guardenia House and Tiera del Mar is one of the Oregon Coast's best kept secrets. the traffic whizzing by on the adjacent highway. Homeowner Response: Just wanted to note - the "highway" is actually a small rural road running along the coastline with a 35 mph speed limit. We had a lovely time at your place! The beach was deserted and just gorgeous with all the sunny weather that we had. Our twin boys and our black lab just loved running on the sandy shores. We also enjoyed seeing some of the years highest and lowest tides and relished the much needed 'disconnect' from the hustle and bustle of the holidays. We had such a relaxing and fun time. I really needed some time to walk the beach and hang out with my husband and our dogs. The house is the perfect "beach house". Comfortable and homey, a block from the beach and nearby Pacific City which as another fantastic beach. I too loved the master bedroom. I can still close my eyes and be back waking up to the sun shining through the forest in the morning. We may try the Pier St. house next time, but we would definitely stay at Gardenia House again. The owner is easy to work with, and keeps it very nice. We really enjoyed the home, it is very nice and plenty of room for six people. The beach was completely deserted in November, even though the weather was great. The house is very warm and relaxing with a lovely, well stocked kitchen. We travel quite a bit and generally rent homes from owners. This was definately one of the nicest places we have stayed at on the coast, we'll definately be back. We returned to Guardenia Street because it offers such a warm, comfortable and relaxing location for us to unwind with our dogs. The weather was perfect and we spent hours outside, relaxing on the huge deck and watching the birds in the woods. The beach is just a short walk from the house and the house has everything we need for a delightful getaway. It’s a treat to wake up to a view of the woods with the birds singing! We keep returning to Guardenia Street because it feels like a “home away from home.” Thanks for making your lovely home available to us! We’ll be back. Guardenia House is a great place to stay in Tierra del Mar, a wonderful little dip in the road along the central Oregon Coast. Situated on the NE corner of the Three Capes Scenic Highway and Guardenia St., the home is nestled in the woods, off the road and has great privacy with only one neighbor in view. Being dog friendly, the atmosphere is very relaxed & casual but plenty comfortable for a beach house. The master bedroom takes the cake with cathedral ceilings and windows from bottom to top which make you feel like you're camping-out in the comfort of the cozy indoors. Beach access is a short, 1 block walk down Guardenia St. and a walk North along the flat and wide white sand takes you quickly beyond the beachfront housing to a very remote and beautiful stretch of beach. Such a relaxing and special place & a great vacation rental. We stayed at the Guardenia Street House for the first time last week. It was our first time, and we had a wonderful visit. My parents (visiting from Ireland) loved waking up in the forest (the master bedroom), the kids loved having their own little bunkhouse, and our dog loved the long, secluded beach. The house was clean, comfortable, and had everything you might need; Susy was great to work with; and we can't wait to go back! MONSOON SPECIAL!! FREE 3rd night throughout off-season: September through first week of June (holidays excluded).